Americas gateway to the universe. Leading the world in preparing and launching missions to Earth and beyond.April 30, 1999 John F. Kennedy Space CenterVol. 38, No. 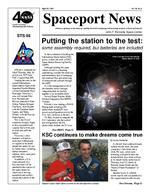 9 Spaceport News STS-96 STS-96 is scheduled for liftoff Thursday, May 20, at 9:32 a.m. EDT from KSCs Launch Pad 39B. Leading the crew on the second International Space Station flight of the Spacehab Double Module will be Commander Kent Rominger. Discoverys crew will include Pilot Rick Husband and Mission Specialists Ellen Ochoa, Tamara Jernigan, Dan Barry, Julie Payette with the Canadian Space Agency and Valery Tokarev with the Russian Space Agency. This is the first of numerous resupply flights to ferry equipment and supplies that will be used to build and outfit the station. Discoverys crew members will deliver more than 5,000 pounds of supplies to be stored aboard the station for use by future crews, including laptop computers, cameras, tools, spare parts and clothing. In addition, a U.S. crane and parts of a Russian crane will be attached to the exterior of the space station for future use in moving equipment and workers around the exterior of the station.Artists concept of the International Space Station on orbit(See MEIT, Page 5)Putting the station to the test:some assembly required, but batteries are included As the excitement of building the International Space Station (ISS) grows, so does the work in KSCs Space Station Processing Facility (SSPF). Although building the space station on orbit is a daunting undertaking, consider the necessary and tremendous task of managing the continual flow and processing of hardware and software through the SSPF. As if the management of all of the elements werent enough, integrating them to function together is an incredible effort. Just ask Ralph Fritsche, MultiElement Integration Test (MEIT) Director. Fritsche is now leading a NASA/ Boeing team initiating a P6 photovoltaic module/Z1 truss power-up configuration prior to the U.S. Labs inclusion in the test. In May, we plan to integrate the U.S. Laboratory into the current test configuration; the P-6 photovoltaic module, the Z-1 truss (See Dream, Page 2)KSC continues to make dreams come trueby Susan Hubscher As the tall, blue-suited astronauts walked into the room, the quiet young boys face broke into a smile. His eyes, which were brimming with painful tears the minute before, now shone with joy as his dream finally came true on Thursday, April 22, thanks to Kennedy Space Center and the Share a Dream Foundation of Ireland. Stephen Coyle, 9, suffered severe injuries and was placed on a life support machine after he andStephen Coyles dream came true when he met Astronaut Rick Linnehan. SPACEPORT NEWSApril 30, 1999 Page 2 Environmental and Energy Awareness Week celebrated around KSC In conjunction with Earth Day activities on April 22, Kennedy Space Center, Cape Canaveral Air Station (CCAS) and Patrick Air Force Base celebrated Environmental and Energy Awareness Week April 19-23. During the week, KSC celebrated its success as a leader in environmental stewardship and energy conservation. Since 1994, KSC has reduced hazardous waste generation by 50 percent, decreased toxic chemical releases by 45 percent and improved facility energy efficiency by six percent.Center Director Roy Bridges enters a Florida Power and Light (FPL) electric car on April 19 as FPL Site Representative Mark Hillman (left) looks on. Stephen Coyle (center) looks up in amazement at the structures in KSCs Rocket Garden during his visit to the space center on April 22. From left are Shay Kinsella, director and founder of Share a Dream; Astronaut Rick Linnehan; Stephen; his sister, Natalie; and Astronaut David Brown. Behind the children is their father, Francis Coyle.KSC Deputy Director for Launch and Payload Processing Loren Shriver at KSCs Visitor Complex. They talked with Stephen about his trip to America and his love of the space program. As they talked, the group walked outside to the Rocket Garden where the astronauts explained parts of the Shuttle and what it is like to fly in space. When you land, the Shuttle is like a bathtub with wings, explained Linnehan. You only get one chance. After the astronauts encouraged Stephen and Natalie to stay in school and study hard, they gave Stephen a patch from STS-90 the same patch Linnehan had on his flight suit. Then Shriver placed a NASA hat on the boys head. We are so glad to have you here, and we hope you have a great visit, Shriver said to the family. Coyle and his family then left on a VIP tour of the center, which included the Orbiter Processing Facility, the Vehicle Assembly building, Launch Pad B, the Apollo/Saturn V Center and the International Space Station Center. As they boarded the bus, Stephens mother thanked everyone again. If you would have told us a year ago that we would be here and experiencing this, I would have laughed at you, she said. Thank you all so much. It is still difficult for the family to discuss the horror of the August 15 explosion. It was scary, said Stephen quietly, describing how he felt after his parents were caught in the explosion of a car bomb last year in Omagh, a city in Northern Ireland. Doctors gave Stephen very little time to live, wrote his mother, Linda Coyle, in a letter to the Share a Dream Foundation. He survived unbelievable odds and was called The Miracle Boy by all the hospital staff. When President Bill Clinton met Stephen in the Belfast hospital on his trip to Ireland last year, he promised Stephen on national television that when he got better, his dream of touring the Kennedy Space Center and meeting a real astronaut would come true. Explaining why he chose to come to KSC rather than anywhere else, Coyle said that he really liked space and that he has followed the space program at KSC. Coyles mother told a reporter that Stephen has a miniature statue of the Shuttle on his shelf at home, and Coyle says that shooting stars are the best thing about space. My sister even has [plastic] stars on her ceiling, said Stephen. When asked by reporters if he would like to be an astronaut oneday, the little boy smiled and nodded. Stephen was accompanied by his parents, Linda and Francis Coyle, his older sister Natalie, and Shay Kinsella, director and founder of Share A Dream Foundation. Stephen met astronauts Rick Linnehan and David Brown andDream ...(Continued from Page 1)the explosion. I was afraid. Stephens parents were also injured in the blast that killed 29 people. Stephens older sister Natalie was not with the family that fateful day. We went shopping in Omagh for equipment for Natalies pony, said Mrs. Coyle. There were big crowds on the street. We had heard there was a festival that weekend. The Coyle family was told there was a bomb scare in the City Hall at the top of the street. As they were heading to the car to leave the city, a nearby car bomb detonated. There was an enormous bang, a flash and smoke, said Linda Coyle, and then there was a terrible silence. Linda found her husband, and soon after, they found Stephen lying against the pavement. Stephen was taken to Omagh hospital and treated for internal injuries, and then flown to Belfast hospital. Francis described the confusion in the hospital as the staff was hit with the emergency and how he kept an eye on Stephen. I kept telling him to fight, said Francis. I told him he had to fight. I even promised him wed get a dog. Stephen says that his fathers advice and promise helped him fight to recover. The familys new dog is named Bart. Stephen continues to be treated for internal injuries, and he is slowly improving both physically and mentally. Since 1992, the 45th Space Wing has reduced the use of ozonedepleting substances by 45 percent and pesticides by 80 percent while increasing recycling by 416 percent. In addition, KSC and the 45th Space Wing continue to be leaders in natural resource prevention. This years theme was Make a World of Difference, and activities included exhibits at the KSC Visitor Complex, CCAS, Patrick Air Force Base and KSC facilities. Exhibitors included conservation organizations, energy-related vendors and others. SPACEPORT NEWSApril 30, 1999 Page 6 NASA recently announced a contract award to Lockheed Martin Astronautics, in Denver, to launch the Vegetation Canopy Lidar (VCL) satellite on an Athena I rocket. Launch is scheduled for August 2000 from a launch pad located on Kodiak Island, Alaska. This will be the first launch to low Earth orbit from the Alaska Aerospace Development Corporations new commercial launch facility. The VCL satellite is designed to precisely measure the Earths vegetation coverage, vegetation depth (or canopy) and topography by using short laser pulses from a LIDAR (Light Detection and Ranging) system. The Athena I rocket will place the satellite into a 261 mile-high orbit above the Earth inclined 67 degrees to the equator. The VCL spacecraft weighs 954 pounds and is 6.8 feet tall by 3.8 feet wide. NASA has launched two other missions onNASA awards launch contract for Athena rocketFire ...(Continued from Page 3)moisture of the soil, has reached 500. The index for desert climates is 800, which the KSC Fire Department expects the Florida index to reach this year. Florida is also three inches below our annual average of rainfall, said Moore. With Florida experiencing the same weather patterns as last year, KSCs Fire Rescue Service is gearing up for another busy season by taking some precautions on center property. Kennedy Space Center sits on 140,000 acres of land. About 10,000 acres are used for spaceport activities, leaving the rest for wildlife and plant growth. KSC Fire Rescue and the U.S. Fish and Wildlife Service are trying to help safeguard remote locations by cutting back bushes and shrubs from around the buildings, conducting logging activities at the South end of property and implementing controlled burns to reduce the fuel load. Moore says the safety precautions are not harming the growth on KSC. Some species of palm and other plants are actually fire-dependent, explained Moore. They need the fires to survive and flourish. The U.S. Fish and Wildlife Service and Fire Rescue Service are working together to fight and prevent fires, said Moore, but if anyone sees an uncontrolled fire in any part of property, the best number to call is 911. For any other questions about fire safety or prevention, employees should contact Henry Pankow, assistant chief of Fire Prevention at 867-3491. Moore reminded people there are easy ways to help in fire prevention: Do not discard cigarettes outside; Watch camp fires and barbeques; Do not use flares or fireworks; Avoid placing wood shingles on roofs; Remove bushes and pine trees around buildings; Post fire emergency telephone numbers; Report hazardous conditions that could cause a wildfire; Be alert! Taking our Daughters to Work at KSCAthena rockets the Lewis satellite from Vandenberg Air Force Base in California on Aug. 22, 1997, using an Athena I, and the Lunar Prospector spacecraft from Cape Canaveral on Jan. 6, 1998, using an Athena II. NASA had previously planned to launch the Clark satellite on an Athena I, but discontinued the program. However, the agency retained its contractual rights to the three-stage Athena I that will now be used for VCL. The VCL mission is being implemented for NASAs Goddard Space Flight Center, Greenbelt, Md., by the University of Maryland, College Park, in support of the Earth System Science Pathfinder (ESSP) Program. The single-science instrument on VCL, the Multi-Beam Laser Altimeter (MBLA), is being built by Goddards Laboratory for Terrestrial Physics. The spacecraft bus for VCL is being built by Orbital Sciences, Dulles, VA. Just months before the launch of the first Shuttle mission to be commanded by a woman, KSC hosted hundreds of girls reaching for their own stars. Daughters of NASA and contractor personnel spent the day at Kennedy Space Center on April 22, learning about robotics (above), space technologies and opportunities to build their futures in the variety of careers available to them. April 22 was the annual Take Our Daughters to Work Day, a nationwide celebration designed to inspire and motive young women. This was KSCs seventh year participating in the event. The theme this year was The Future is Me, stressing to young women the importance of setting goals and building self-esteem. Featured events included science and robotics demonstrations, an Audobon Society bird of prey demonstration, and security and fire prevention displays. Participants spent the remainder of the day in the parents or sponsors work areas observing work environment activities. A Take Our Sons to Work Day is currently planned for June 8. SPACEPORT NEWS April 30, 1999 Page 7 Top International Space Station (ISS) and Shuttle management positions at Johnson Space Center (JSC) in Houston have changed. NASA Space Shuttle Program Manager Tommy Holloway was named manager of the ISS Program, effective April 19. He succeeds Randolph Brinkley, who is departing NASA to pursue opportunities in the private sector. Ronald Dittemore, a 22-year veteran of the Space Shuttle Program, was named to replace Holloway as Space Shuttle Program manager. Holloway began his career with NASA in 1963, planning activities for Gemini and Apollo flights in the Mission Control Center. He was a flight director in Mission Control for early Space Shuttle flights and became chief of the Flight Director Office in 1985. In 1989, he was named assistant director for the Space Shuttle Program for the Mission Operations Directorate. In 1992, he became the deputy manager for Program Integration with the Space Shuttle Program, and, in 1994, he was named director of the Phase I Program of Shuttle-Mir dockings. Holloway was named manager of the Space Shuttle Program in August 1995. I have never worked with a better team than those involved with the Shuttle program, and the decision to accept a position as manager of the Station program was a difficult one, said Holloway. I am extremely proud of the job those working on the Shuttle perform, and I am heartened by the fact that Ron Dittemore will manage the program. The first components of the International Space Station are in orbit, but there are many exciting challenges ahead as we continue its assembly during the next five years. Dittemore joined NASA in 1977 as a Space Shuttle propulsion systems engineer and worked as a propulsion systems flight controller in Mission Control during the early Shuttle flights. In 1985, he was selected as a Shuttle flight director in Mission Control, leading control teams during all phases of flights, including launch and entry. In 1992, Dittemore was named deputy assistant director of the Space Station Program in the Mission Operations Directorate at JSC. Since 1993, he has worked in management of the Space Shuttle Program, serving first as the Deputy Manager for Space Shuttle Program Integration and Operations. In 1995, he became manager of Space Shuttle Program Integration and served as chairman of the Mission Management Team during Shuttle flights. In 1997, Dittemore was named manager of the Space Shuttle Vehicle Engineering Office in the Space Shuttle Program. The Space Shuttle is more reliable, more capable and more efficient today than ever before, noted Dittemore. At the same time, with assembly of the station, the Shuttle has a bigger job ahead of it than ever before. As we do that job, above all, my goal is to fly the Shuttle safely and continue the tradition of excellence that has been instilled in this program. The Shuttle has a lot of life ahead with the capability to continue to fly for decades to come, and we plan to continue to make it as safe and efficient as possible as we build the station and prepare for the future. Brinkley was scheduled to leave NASA by the end of April. He joined NASA in August 1992 in the Office of Space Flight following a distinguished career as an officer and pilot in the United States Marine Corps. In December 1992, Brinkley was named mission director for Shuttle mission STS-61, the first servicing mission to the Hubble Space Telescope. In January 1994, Brinkley was named manager of the International Space Station program at Johnson Space Center, overseeing the implementation of the newly redesigned project under a single prime contractor while incorporating Russia as a new partner. Brinkley leaves a program that in the last three weeks has received distinguished awards for its accomplishments, including the National Space Clubs Nelson P. Jackson Award and the United States Space Foundations Space Achievement Award.Space station and Shuttle program management changes Brinkley recently was presented the NASA Distinguished Service Medal by NASA Administrator Daniel Goldin. I have been provided a truly unique opportunity to contribute to this historic and extraordinarily difficult undertaking by NASA and its international partners, Brinkley commented. With the long awaited first element launches of U.S. and Russian hardware and the incredibly successful on orbit assembly of Zarya and Unity, I take great professional pride and personal satisfaction in this historic accomplishment. Although there are many challenges ahead for the International Space Station, Brinkley continued, I have full confidence that the talented and dedicated members of the ISS team will continue to be successful.Tommy HollowayAsian-American Heritage Month to be celebrated during May at KSCCome to KSCs Fitness Center Grand Opening on May 4The KSC fitness centers are proud to announce the opening of the newly renovated and expanded Operations and Checkout (O&C) Building Fitness Center. The new facility has doubled in size and offers new equipment, a large aerobics room, motivational and educational programs and renovated locker rooms. To celebrate the expansion, the staff is planning a Grand Opening event to be held on Tuesday, May 4, at 10 a.m. at the new O&C facility on the first floor. There will be a ribbon cutting ceremony, tours of the new fitness center, special guests, door prizes and fun. Everyone is welcome to attend the Grand Opening on May 4. Help celebrate Asian-American Heritage Month by attending the Asian Pacific Islander Working Group luncheon on Friday, May 7, at 11:30 a.m. in the Operations and Checkout Buildings Mission Briefing Room. Tickets are $7.50 per person and are on sale through May 5. For ticket information or to volunteer to support the group, call Kenny Aguilar, 867-2307; Marina Harris, 867-2468; Rupert Lee, 8671403; Paula Nosca, 8670745; or Christopher Chan, 730-5547. John F. Kennedy Space Center Managing editor. . . . . . . . . . . . . . . . . Bruce Buckingham Editor. . . . . . . . . . . . . . . . . . . . . . . Susan Maurer Editorial support provided by Information Dynamics Inc. Writers Group. NASA at KSC is on the Internet at http://www.ksc.nasa.gov USGPO: 733-112/80030Spaceport News Spaceport News is an official publication of the Kennedy Space Center and is published on alternate Fridays by the Public Affairs Office in the interest of KSC civil service and contractor employees. Contributions are welcome and should be submitted two weeks before publication to the Media Services Branch, AB-F1. E-mail submissions can be sent to Susan.Maurer-1@ksc.nasa.gov SPACEPORT NEWSApril 30, 1999 Page 8 The orbiter Columbia sits outside Orbiter Processing Facility (OPF) bay 1 after transfer from the Vehicle Assembly Building (VAB), where it was stored temporarily while Discovery was in OPF bay 1 being processed for mission STS-96. Columbia is scheduled to fly on the following mission in July, STS-93, when it will carry the first female commander on a Shuttle mission, Eileen Collins, with four other crew members to deliver the Chandra X-ray Observatory to space.The Shuttle Shuffle from rollover to rolloutThe orbiter Discovery rests inside KSCs Vehicle Assembly Building after rollover from the Orbiter Processing Facility Bay 1. Discovery is being readied for mission STS-96, targeted for launch May 20. STS-96 is a logistics and resupply mission for the International Space Station, carrying payloads such as a Russian crane, the Strehla; a U.S.-built crane; a Shuttle Vibration Forces experiment; and Starshine, a student-led experiment.FUSE ...(Continued from Page 4)involved in the evolution of the galaxies, stars and planetary systems. FUSE will do this by investigating light in the far ultraviolet portion the electromagnetic spectrum. FUSE processing at CCAS began with a functional test of the satellites systems. Another milestone achieved in the ultra-high clean room facility at Hangar AE Space Shuttle Discovery makes its first motion from the Vehicle Assembly Building (VAB) at 7 a.m. on April 23 on its way to KSCs Launch Pad 39B. Discovery is scheduled to launch on May 20 at 9:32 a.m., when it will carry the seven-member STS-96 crew to the International Space Station (ISS) on the second U.S. ISS mission. Kent Rominger will command the crew, which includes Pilot Rick Husband, and Mission Specialists Ellen Ochoa, Tamara Jernigan, Dan Barry, Julie Payette with the Canadian Space Agency and Valery Tokarev with the Russian Space Agency. Discovery is scheduled to return to KSC on May 30 at 5:27 a.m. at the end of a nearly 10-day mission to resupply the International Space Station.was the installation of flight batteries. Installation and testing of the solar arrays is scheduled for mid-May. There will also be testing of the satellites communications and data systems while linking FUSE with the spacecraft control center at The Johns Hopkins University, Baltimore, Md. FUSE was developed and will be operated by The Johns Hopkins University under contract to Goddard Space Flight Center, Greenbelt, Md. Management of the launch is KSCs responsibility.